Mowing a lawn with tall grass can be particularly challenging to do with a reel mower, because reel mowers cannot typically be set as high as a powered mower. For grass that's as high as 5 or 6 inches, adjust your reel mower to its highest cut setting and mow as usual. 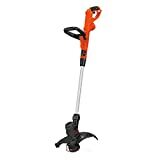 For grass taller than 6 inches, you may need to use grass whip or string trimmer to get the grass short enough to mow with a reel mower, or you may have to use powered mower such as a push mower or riding mower. To maximize your chance of success cutting tall grass with your reel mower, we're including several tips below. This is of course stating the obvious, but make sure the mower is set to its highest cut setting. Most reel mowers' cut height go up to 3 inches, except the Fiskars Staysharp Max reel mower which can go up to 4 inches. If you haven't oiled the rotating parts of your mower in the past 6-12 months, follow your mower's user manual to do so. This way, the blades will be able to spin at maximum speed. Also make sure the blades are sharp. If they're not, sharpen them yourself or take them to a local mower repair shop to get them sharpened. Sharpening the blades is one of the most important things you can do increase your chances of mowing tall grass successfully. Do a quick walk-through in the yard and get rid of any big sticks or debris that could get in the way of the mower. It's easy to miss sticks hidden in tall grass, so be extra careful when searching for them. Those pesky branches and debris can get in the way, making it very difficult to get a good clean cut. It's very difficult to mow a lawn with a reel mower when the grass is wet, even when the grass is at a reasonable height. So if at all possible, wait till the grass is dry, such as late afternoon or several days after it rains. While mowing a wet lawn, the mower wheels can loose traction causing the blades to not spin as quickly, not to mention the safety risks of slipping and getting cut by the mower blades. By attaching a grass catcher to the back of the reel mower, the grass will be able to go somewhere instead of getting caught up and clogged in the blades. This is particularly helpful if you plan to mow the lawn twice - once at the highest cut setting and again at the desired hight. If you've tried everything above and still can't seem to get the grass cut with your reel mower, then you may need to use a grass whip or a string trimmer. A grass whip is a manual weed cutter that you swing back and forth to trim tall grass or weeds. A string trimmer is a powered option that takes less energy to use, and can be just as effective. Use one of those two devices to get the grass low enough so that you can mow it with a reel mower. So that's how to cut tall grass with a reel mower. If non of these tips work and using a grass whip isn't an option, your only other option might be to use a powered mower. Got any tips for mowing tall grass? Leave us a comment below!